For your convenience to contact Big TV We have provided all possible information of Big TV. You can contact Big TV on the given phone number +91-22-30373333, Toll Free Nos :1860-200-6666, 1800-200-9001. To know the address location of Big TV it is also presented here Dhirubhai Ambani Knowledge City, Thane Belapur Road, Kopar Khairane, Navi Mumbai-400709, India. Contact them by sending email to Big TV you will find an email address here . 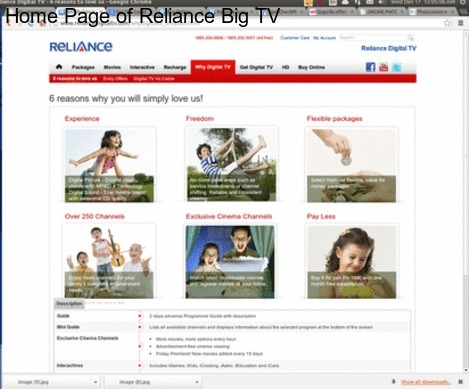 To know more about Big TV, go to their website www.reliancedigitaltv.com and collect all possible information from there. You can contact them from their website also. If you have any comment to post or you want to register a complaint against Big TV, you are advised to go to the below box and post your view there. +91-22-30373333, Toll Free Nos :1860-200-6666, 1800-200-9001. Big TV originally known as Reliance Big TV is a Direct to Home (DTH) service provider in India that offers several communication services such as direct broadcast satellite service covering satellite television, audio programming and interactive television services. DTH services were first launched in the country in the year 2004 with the name of 'Dish TV' owned by 'Zee Entertainment Enterprises'. Reliance introduced its DTH service in the year 2008 with the name of Reliance Big TV. It is a product of 'Reliance Communications Ltd' a subsidiary of Reliance ADAG. It uses MPEG4 technology in which 35 to 40 channels per transponder are transmitted. The company has a large network of over 100,000 company owned stores in 6,500 cities and towns in India. The company was first to offer 32 Pay-Per-View Movie Channels that is the highest by any DTH player in India. Apart from big TV, Reliance Communications has been working in other segment such as telecommunications, broadband, national and international long distance operations and investment. Reliance Communication is one of the largest Telecom operators in Indian offering services to more than 150 million subscribers. As of 2013, Reliance Communication had over eighteen thousand employees. Reliance Big TV direct to home service is available in numerous monthly subscription packs, according to the needs of customers; these packs have been given names like Bronze, Silver, Silver Sports, Gold and Platinum. It also allows customer to buy long-term offers on heavy discount, these packs can be of four months, eight months and twelve months. Apart from this, Big TV gives various other services such regional packs and Add ons packs. There are twelve regional packs being offered by Big Tv including Hindi Bhojpuri, Odia, Bangla, Marathi, Gujarati, Rajasthani, Malayalam, etc. Moreover' Big Tv also gives few interactive services at home's convenience such as iGames, iEducation, iCare, iNteractive, iGames and iKids. iEducationiEducation has been meant to offer kids easy learning where they can get key learning in Physics, chemistry, Biology and Math for students of standard nine, ten and twelve. Reliance Big Tv also provides the facility of video on demand where customer can choose latest movie according to the taste. According to the report of 2014, the company has been broadcasting more than two hundred fifty channels. The customer care number of Big Tv can be contacted from Jamshedpur, Kolkata, Pune, Nasik, Trichy, East Delhi, Indore, Himachal Pradesh, Vadodara, Vellore, Goregaon, Ranchi, Gwalior, Kerala, Chennai, Allahabad, Coimbatore, Bangalore, Raipur, Jharkhand, Rajkot, Jaipur, Patiala, Orissa, North Delhi, Cochin, Gujarat, Uttar Pradesh, Thane, Andhra Pradesh, Jalandhar, Shillong, Jammu, West Bengal, Navi Mumbai, Mysore, Kanpur, Pondicherry, Nagpur, Meerut, Assam, Madhya Pradesh, Madurai, Chhattisgarh, Dehradun, Erode, Delhi, Punjab, Faridabad, Surat, Bhubaneswar, Ghaziabad, Gorakhpur, Udaipur, South Delhi, Baroda, Amritsar, Gurgaon, Agra, Vijayawada, Chandigarh, Trivandrum, Karnataka, Patna, Mumbai, Bihar, New Delhi, Ludhiana, Salem, Uttarakhand, Lucknow, Rajasthan, Visakhapatnam, Noida, West Delhi, Bhopal, Maharashtra, Ernakulam, Ahmedabad, Mangalore, Goa, Sangli, Hyderabad, Varanasi, Aurangabad, Tamil Nadu India, etc. A customer can get technical assistance and respond to the queries at this toll free number, 18002009001 while its other number is, 18602006666. The headquarters of Big TV is housed in the corporate office of its parent company, Relance Communications Limited at Dhirubhai Ambani Knowledge City, Thane Belapur Road, Kopar Khairane, Navi Mumbai, India. The contact number of Big TV head office is, +91-22-30373333. A customer can get the basic and detail information as well about BIG TV regarding its operations, functions and compatibility. 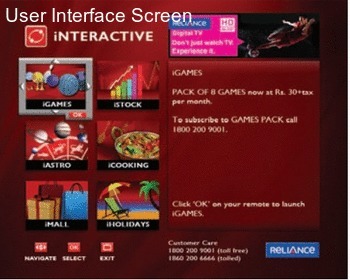 Please visit this link, www.reliancedigitaltv.com/home.html. BIG TV also allows its subscribers to watch movie on demand and can be ordered by typing an SMS: SUB and send it to 554546. A subscriber can call at 18002009001, which is a toll free. Search in google Big TV with the name Google Plus, Facebook, Twitter, linkidin Pages and you will find more information on these pages. Search in google like Big TV Google Plus Page. When you call to Big TV, ask for toll free number to enjoy charge free calling. At the first step When you call to Big TV please do not forget to tell them that you have found their contact number on findbusinessaddress.com.